Greensfelder attorney Jessica E. Courtway will be honored among the St. Louis Business Journal’s 30 Under 30 class of 2018. The honorees were chosen from among more than 200 nominations. They will be recognized at a July 12 event in St. Louis and featured in the July 6 edition of the Business Journal. Courtway is a member of Greensfelder’s Construction industry group, representing clients in a variety of construction matters. 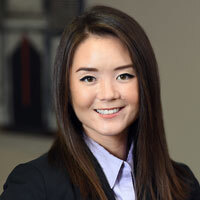 She also holds a number of leadership positions in professional and community organizations, including as president of the Missouri Asian-American Bar Association and vice chair of the Bar Association of Metropolitan St. Louis’ Young Lawyers Division. She was recently selected among the American Bar Association Forum on Construction Law’s class of Diversity Fellows for 2018. She is a 2014 graduate of Washington University School of Law.